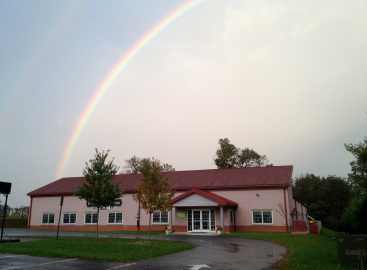 Pine Grove Early Learning Center is a community service of Pine Grove United Methodist Church located in the "Hereford Zone" of Northern Baltimore County. The Church purchased the program in 1999 to meet the needs of the surrounding community. We are committed to the physical, emotional, educational, and spiritual growth of your child. We encourage learning and development through curriculum that is tailored to each age group. All programs are developmentally appropriate and geared toward helping your child develop at his or her own pace. We create an environment that helps your child flourish as an individual where they experience their own triumphs in learning. We are licensed through the Maryland State Department of Education and provide care for children age 2 through 5th grade. We offer full and part day care as well as full and partial week schedules. We have fantastic children, qualified teachers, a beautiful separate building that opened in 2009, and a newly renovated playground. We offer exciting extras to our program such as weekly visits from Rebounders Gymnastics, computers in every classroom and monthly entertainers that are related to the curriculum. We provide two snacks a day for children who attend our full day program. School age and children who attend half day receive one snack with us. Our School Age children come to us before and after school and are transported to Prettyboy Elementary School via the Baltimore County school buses. We are open from 6:30 a.m. to 6:00 p.m. Monday through Friday. If you are looking for a home away from home for your children give us a call to see what openings we have available. We'd love to schedule a tour and meet you.